The ForeignKey attribute is used to configure a foreign key in the relationship between two entities in EF 6 and EF Core. It overrides the default conventions. As per the default convention, EF makes a property as foreign key property when its name matches with the primary key property of a related entity. name: Name of the associated navigation property or the name of the associated foreign key(s). Consider the following example of one-to-many relationship among entities. The above example depicts a one-to-many relationship between Student and Standard entities. To represent this relationship, the Student class includes a property StandardId with reference property Standard and Standard entity class includes collection navigation property Students. 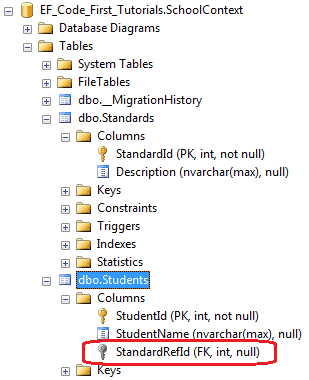 A property name StandardId in Student entity matches with the primary key property of Standard entity, so StandardIdin Student entity will automatically become a foreign key property and corresponding column in the db table will also be a foreign key column as shown below. The [ForeignKey] attribute overrides the default convention for a foreign key It allows us to specify the foreign key property in the dependent entity whose name does not match with the primary key property of the principal entity. The [ForeignKey] on the foreign key property in the dependent entity and the related navigation property name can be specified as a parameter as shown below. In the above example, the [ForeignKey] attribute is applied on the StandardRefId and specified the name of the navigation property Standard. This will create the foreign key column named StandardRefId in the Students table, preventing the generation of a StandardId column in the database. The [ForeignKey] attribute can be applied to the navigation property and the related foreign key property name can be specified as shown below. In the above example, the [ForeignKey] attribute is applied on the Standard navigation property and specified the name of the foreign key property StandardRefId. This will create the foreign key column named StandardRefId in the Students table, preventing the generation of a StandardId column in the database. The [ForeignKey] attribute can be applied to the navigation property in the principal entity and the related foreign key property name can be specified in the dependent entity as shown below. In the above example, the [ForeignKey] attribute is applied on the Students navigation property in the principal entity Standard. 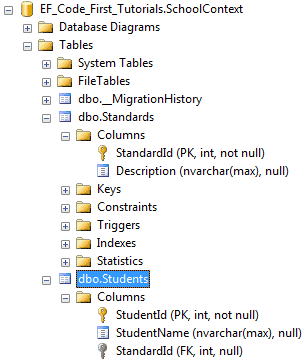 This will create a foreign key column StandardRefId in the Students table in the database. LINQ to Entity is a great ORM for querying and managing database. It offers a lot of things, so it is mandatory to know about performance of it. These are right up to a certain point as LINQ comes with its own penalties. There are some tips and tricks that we should keep in mind while designing and query database using entity framework ORM. Here is a list of some tips that I would like to share with you. Entity Model specifies a single unit of work, not all our database. If we have many database objects that are not connected to one another or these(log tables, objects used by batch processes etc.) are not used at all. Hence these objects are consuming space in the memory and cause performance degrades. So try to make separate entity models of related database objects. This option allows us to turn off the object cache and unnecessary identity management of the objects. When the object of ObjectContext is created first time in the application, the entity framework creates a set of classes that is required to access the database. This set of classes is called view and if your data model is large then creating the view may delay the web application response to the first request for a page. We can reduce this response time by creating view at compile time by using T4 template or EdmGen.exe command-line tool. Avoid fetching not required fields from the database. Suppose I have table of Customer with 20 fields and I am interested only in three fields – CustomerID, Name, Address then fetch only these three fields instead of fetching all the fields of the Customer table. In linq we have Var, IEnumerable, IQueryable, IList type collection for data manipulation. Each collection has its importance and performance impact on the query, so beware of using all these collection for data manipulation. Make a query to compiled query if it is frequently used to fetch records from the database. This query is slow in first time but after that it boost the performance significantly. We use Compile method of CompiledQuery class for making compiled query. In above query we are passing the string parameter city for filtering the records. When we are binding data to grid or doing paging, retrieve only required no of records to improve performance. This can achieved by using Take,While and Skip methods. In LINQ, we use contains method for checking existence. It is converted to “WHERE IN” in SQL which cause performance degrades. Views degrade the LINQ query performance costly. These are slow in performance and impact the performance greatly. So avoid using views in LINQ to Entities. If you want to debug and optimize your query then LINQ Pad is a great tool for this purpose. I am a big fan of LINQ Pad. It is very useful for query construction, debugging and optimization. Dump method of LINQ Pad give the result of above query in the result window. I development against a 2008 copy of SQL Server, which normally isn’t a problem, until….. I pushed out my latest code to the production system, which runs SQL 2005, and started smoke testing the system. As soon as I tried to write a record, i got the data type exception. Its painfully in the innerexception. So, I think to myself, I am not doing anything amazing here. I am just trying to use the Entity Framework to write simple data. Well, apparently there is a tag in the store model saying what version of SQL you are targeting. Is there an easy property window for this? Nope. Open the XML. If you change the 2008 out the server version you are targeting. 2005 or 2000 if your old, and voila. Up and running. I guess I need to upgrade the production servers to 2008. What a pain. <Schema Namespace="MyDataModel.Store" Alias="Self" Provider="System.Data.SqlClient" ProviderManifestToken="2005"
Hope this would be helpful! In this post, I’d like to look at how we might be able to take our example a bit further and use some of the common patterns such asRepository and Unit Of work so that we can implement persistence specific concerns in our example. I also want to be able to query for a product based on ID. There is more than one “correct” way to approach this problem. I’ll likely be making many simplifying assumptions as I go – the objective is to show a very high level sketch of how you might implement the two patterns to solve the problem at hand. Normally, when using TDD, I’d start out with tests and use my tests to evolve my design incrementally. Since I’m not following TDD in this example, please bear with me if you see me doing things like defining an interface upfront, instead of letting tests and commonalities dictate the need for an interface, etc. This sounds good to me for the moment. Defining an interface like this for your repository is a good idea, especially if you are interested in writing tests using mocks or fakes and it allows for better unit testing by keeping your database out of the equation entirely. There are blog posts coming in the future that cover testability, mocks and fakes, etc. You might take this interface definition a bit further and define a common IRepository for dealing with concerns that are common for multiple repository types. This is fine thing to do if you see that it works for you. I don’t necessarily see the need yet for this particular example and so I’ll pass on it for now. It is entirely possible that this becomes important as you add more repositories and refactor. Let’s take this repository and see how we might build an implementation of it that leverages Entity Framework to enable data access. First of all, I need an ObjectContext that I can use to query for data. You might be tempted to handle ObjectContext instantiation as a part of the repository’s constructor – but it is a good idea to leave that concern out of the repository and deal with that elsewhere. In the above snippet, NorthwindContext is my typed ObjectContext type. Let’s now provide implementations for the methods required by our ICustomerRepository interface. Note that I chose to expose the results as IEnumerable<T> – you might choose to expose this as an IQueryable<T> instead. There are implications to doing this – in this case, I am not interested in exposing additional IQueryable based query composition over what I return from my repository. You may be tempted to also implement the save functionality as a part of the AddCustomer method. While that may work for this simple example, it is generally a bad idea – this is exactly where the Unit of Work comes in and we’ll see in a bit how we can use the this pattern to allow us to implement and coordinate Save behavior. For dealing with my Product and Order related requirements, I could define the following interfaces (and build implementations much like CustomerRepository). I’ll leave the details out of this post for brevity. You may have noticed this already; even though we didn’t implement any specific pattern to explicitly allow us to group related operations into a unit of work, we are already getting Unit of Work functionality for free with NorthwindContext (our typed ObjectContext). The idea is that I can use the Unit of Work to group a set of related operations – the Unit of Work keeps track of the changes that I am interested in until I am ready to save them to the database. Eventually, when I am ready to save, I can do that. Note that with a Unit of Work, you might also choose to implement Undo / Rollback functionality. When using Entity Framework, the recommended approach to undo is to discard your context with the changes you are interested in undoing.